Click this link for the full story. The most serious RCRA violations resulted from cracks and pits in secondary containment structures for several tanks and pieces of equipment at the Midland facility. Secondary containment structures are ditches, walls, and other types of structures intended to hold in accidental spills and releases of hazardous waste from tanks and equipment. Cracks and pits in secondary containment structures threaten the integrity of the structure, which can result in a release of hazardous waste into the surrounding environment. 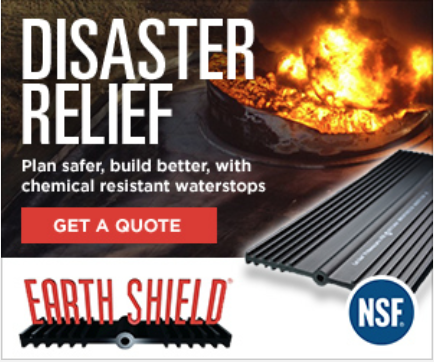 JP Specialties, Inc. / Earth Shield® is the leading manufacturer of chemical resistant waterstop solutions and has recently begun supplying DOW projects throughout Michigan with chemical resistant waterstop to avoid future RCRA and Clean Water Act violations. Penn Yan, NY — The Department of Environmental Conservation released its revised recommendations on mitigating the environmental impacts of high-volume hydraulic fracturing “fracking” July 1. Those opposed to the practice argue that the recommendations allow the state to apply double standards to protecting drinking water supplies. •High-volume fracturing would be prohibited in the New York City and Syracuse watersheds, including a buffer zone. •Drilling would be prohibited within primary aquifers and within 500 feet of their boundaries. •Surface drilling would be prohibited on state-owned land including parks, forest areas and wildlife management areas. •High-volume fracturing will be permitted on privately held lands under rigorous and effective controls. •DEC will issue regulations to codify these recommendations into state law. • Well water and other water protection: No permits would be issued for sites within 500 feet of a private water well or domestic use spring. No permits may be issued for a proposed site within 2,000 feet of a public drinking water supply well or reservoir at least until three years of experience elsewhere have been evaluated. No permits will be issued for well pads within a 100-year floodplain. •Additional Well Casing to Prevent Gas Migration: In most cases, an additional third, cemented well casing is required around each well to prevent the migration of gas. The three required casings are the surface casing, the new intermediate casing and the production casing. • Spill control: Flowback water on site must use watertight tanks within a secondary containment. No open containment may be used. Secondary containment for all fracturing additive containers, additive staging areas and flowback tanks will be required. • Stormwater Control: Strict stormwater control measures will be required. A special permit will be required to withdraw large volumes of water for industrial and commercial purposes. All withdrawals from surface water bodies will be subject to limits to prevent impacts upon ecosystems and other water quantity requirements. Identification of the water source an applicant intends to use will be required. An annual report must be issued on the aggregate amount of water it has withdrawn. Applicants must have DEC-approved plans for disposing of flowback water and production brine. DEC would institute a process to monitor disposal of flowback water, production brine, drill cuttings and other drilling waste streams that is similar to the handling of medical waste. DEC would notify local governments of each well permit application for high-volume fracturing. Applicant must certify that a proposed activity is consistent with local land use and zoning laws. Failure to certify or a challenge by a locality would trigger additional DEC review before a permit could be issued. The 2011 environmental report identifies 322 chemicals proposed for use in New York and includes health hazard information for each as identified by the NYS Department of Health. Applicants must fully disclose to DEC all products utilized in the high-volume fracturing process. Applicants must agree to publicly disclose the names of the additives, subject to appropriate protections for proprietary information. Operators will be required to evaluate using alternative additives that pose less potential risk. Enhanced air pollution controls on engines used at well pads will be required. DEC will monitor local and regional air quality at well pads and surrounding areas. The use of existing pipelines will be required rather than flaring gas. Disturbing the surface of the land is strictly restricted in forests of 150 acres or more, or grasslands of 30 acres or more, by requiring applicants to comply with best management practices. • Socio-economic conditions including positive and negative impacts. • Transportation infrastructure, current road use and the impacts of increased traffic. • Visual and noise impacts. DEC expects the research to be completed by July 31. This research will be considered and reflected in the final draft of the report. Upon final adoption of the permitting standards, DEC will implement a system of oversight, monitoring and enforcement with close consultation with local governments and communities. • funding to ensure the proper oversight, monitoring and enforcement by state and county agencies responsible for drilling activities and reviewing water sampling data. •a fee structure for drilling development. • a mechanism for the funding of infrastructure improvements.